Fine-speckled Semi-slug (Stanisicarion virens)This native species has an attractive, medium-sized, ear-shaped shell with a silky, amber-green appearance - ‘virens’ meaning green. 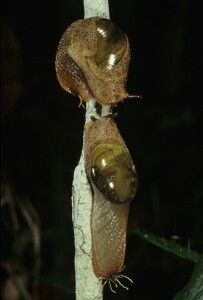 (Semi-slugs are snails that cannot retract into the shell because it is much-reduced in size). The spire is very low and the last coil of the shell is large. Shells of this species can reach up to 17 mm in diameter. Animal colour varies but is generally pinkish grey with irregular, darker markings. The sides of the foot are pink to red and the animal’s mantle is orange or pink with fine black speckles. It lives under logs and fallen palm fronds in rainforest and drier forests, and can frequently be found in suburban gardens. Recent studies have indicated that this may be a complex composed of a few different species. (This species formerly placed in the genus Fastosarion and before that, Helicarion). The Fine-speckled Semi-slug ranges from around Taree in New South Wales northwards to about Rockhampton, Queensland.